Our Pick and Mix stand accommodates 25 varieties under self closing acrylic lids. They can be assembled/dissembled in minutes and can be transported even in a Mini should you so wish! They come complete with bins/lids,shelf strips for variety and price labels, headboard and a poly bag holder or a centre bin can be used as an alternative for paper bag usage.Additionally it comes with 5 scoops and two tongs.In fact everything you need to offer Pick n Mix. 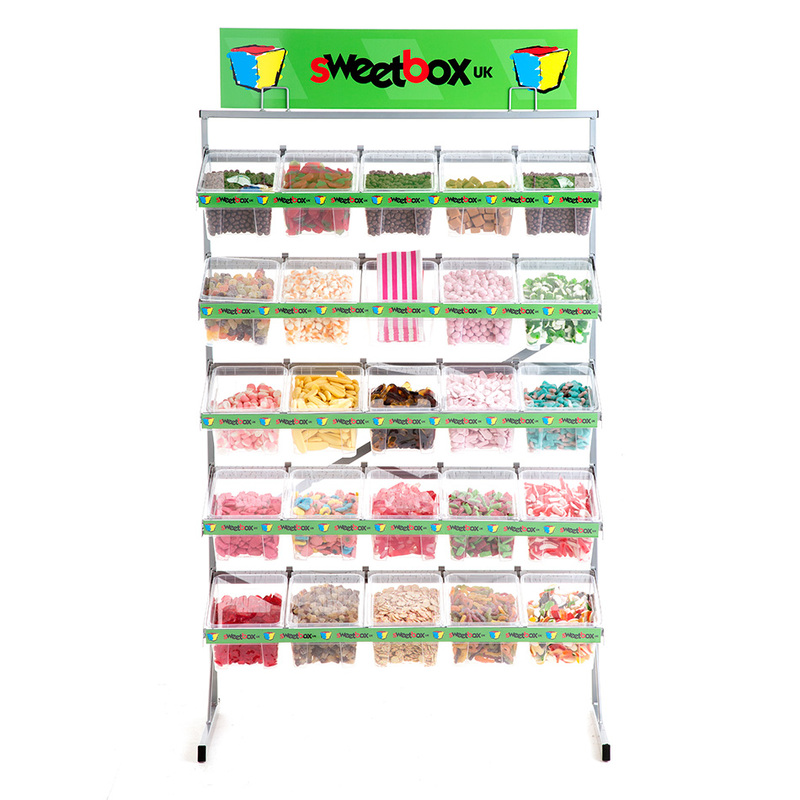 A Pick and Mix Stand for only £375 , complete with everything you need and includes free delivery . Castors can be added to all our Pick n Mix stands for a small additional fee. Visit our Extras page and add this to your basket if you wish them fitting to your stand. They are constructed from silver powder coated steel and are therefore very durable.Many other stands currently available are easily damaged as they are predominantly made from acrylic and offer no protection from accidental damage. These units lend themselves ideally to convenience retailers , Pick and Mix stand hire operators or individuals who wish to own their own unit for fun events. A downloadable stand management brochure is available upon purchase that assists in all aspects of pick n mix retailing. Dimensions 1000mm width 1700 height 450m depth. This unit now has the facility of being a double sided unit with the addition of 5 shelves to the reverse plus leg supports, making it a 5o bin display unit. Please call for details and price. If you wish to order a Pick n Mix stand for delivery to Ireland please add the shipping charge of £95 plus VAT as can be found under Extras in our on line shop. Please allow up to 5 – 7 working days for delivery.